Oct. 25, 2017 6:30 p.m.
Erik Abbink and Jacqueline Perriam, Oak Bay residents, are part of a team that received a $10,000 grant from Storyhive to produce their web series pilot. Abbink and Perriam, of Oak Bay Studios, are tasked with making the music on Against The Grain: A Guide to Nonconformity, by David I Strasser. The web series offers a look into diverse lifestyles of B.C.’s successful and dynamic mountain culture athletes, artists, and creators. Out of 215 entries, Against The Grain: A Guide to Nonconformity is one of 30 finalists from B.C. and Alberta the pilot available in March 2018 on Telus Optik TV On Demand and on storyhive.com. Abbink and Perriam, moved to Oak Bay from Fairfield about four years ago. Immediatly Perriam began teaching piano in their south Oak Bay home while Abbink started Oak Bay Music a year later, bringing a variety of concerts and a new music festival to town. About a year ago, Perriam recalls, Strasser, director of Against the Grain, sought their advice on another film, *raw. “It planted a seed,” Perriam said. She nurtured that seed, nudging Abbink until he agreed they would pursue music for film and television. Both took courses through Berklee College in Boson and loved it. Their first official project was a Bruce Saunders documentary Chomavision. Plus they stayed in touch with Strasser, leading to Against the Grain. Their job, in a short time frame, is to fill the voids with the emotion and inspiration expected of the director based on a session where they all decide where music goes and the mood they seek to set. 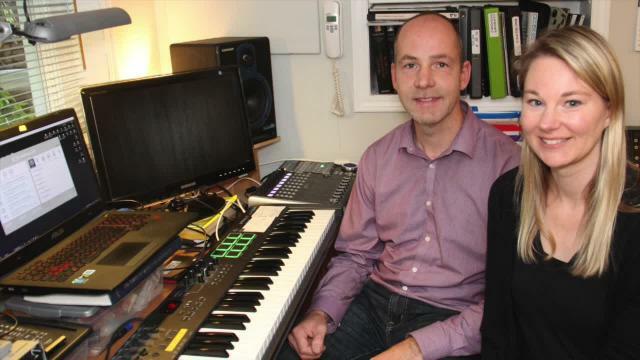 The couple works with both music samples in the computer and live work of their own – him on sax, her on piano – or guest musicians. All the composition is done on a powerful computer. A one minute piece, with both working on it, can take a week to complete between composition and sound mixing. The $10,000 grant includes airing of the web series pilot. The team now enters the next stage of the program, competing for an additional $50,000 grant to bring their full web series to life. Fans of the pilot will vote and select one finalist from each province as the overall winners. The top two winners will also receive customized career training, mentorship and distribution opportunities. Voting opens in February 2018.